Don't be fooled by all the talk of glitches and quirks—these artistic anomalies are not accidental. The artists below feature works of digital tampering, photographic altering and consciousness surrendering, all of which create exhibits of mystery and allure. 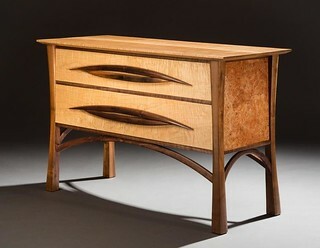 The processes behind these pieces of art are deceptively simple because any look into their techniques will reveal a threshold of deep intention and design. Having trouble getting your hands on the most recent issue because of copies flying off the shelves? 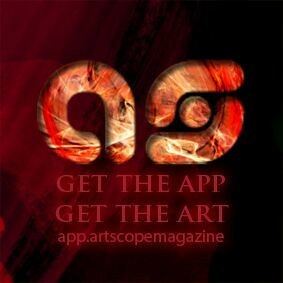 No worries, because artscope is now available in Newsstand for iOS! 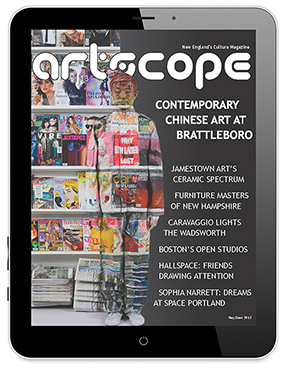 To find and purchase your own artscope interactive digital edition, just use this link to connect to our Newsstand issues, or search "artscope" in the App Store. Once downloaded, our available issues will show up in your Newsstand. You can purchase new issues as soon as they hit the press or set up a year subscription to guarantee instant access. A9, Two Image Composite by Sabato Visconti, 24" x 16". No, this is not a mistake. This is not a temporary malfunction or irregularity. This is art. The Loft Parlor, a contemporary art space located in the heart of Easthampton's Mill District, is currently exhibiting Memories Corrupt, a solo exhibition by Sabato Visconti. The featured artwork is a part of his Glitch Photography, an ongoing project that explores the digital nature of contemporary photography and its relationship to human memory. Visconti, a locally based commercial and fine art photographer, stumbled upon the "glitch" technique. "I discovered glitch photography almost by accident, when my photographer friend's compact flash memory card started corrupting every JPEG photo we took. I wanted my own broken memory card, but tampering with a CF card isn't as easy as it seems. When I opened a corrupted JPEG in a hex code editor I learned that the broken card was writing zeroes randomly throughout the file. That's when I figured out I could guide this seemingly random process." Visconti exploits the corruption of the digital files through displacement of codes and other techniques. So no, these glitches are not errors. The process is no longer an accident, but a controlled destructive process that alters aesthetic and changes the way we perceive visual information. In his first ever solo exhibition of this series, Visconti aims to capture the visual momentum of these glitches and foreshadows the exponential growth of the Glitch Art movement. Memories Corrupt is on view now through Friday, November 1st at The Loft Parlor. Come be a witness to Glitch Art before it transcends its pioneering stages. That way, you can say you've always been a fan. 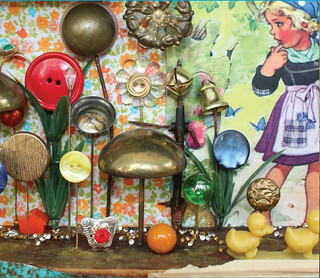 Roslindale Open Studios (ROS) is an annual community arts event held on November 2 & 3 from 11am-5pm. This is a free family friendly event, with artists showing and selling paintings, jewelry, pottery, textiles, sculpture, and more. Visitors from all over are invited to business sites, group sites, and home studios using the map in our printed brochure. Scheduled events include children's art, wine & cheese tasting, live music, home studio bingo and a bike tour. Shuttle transportation is also available. ROS is a great event that brings together artists, residents, and visitors alike. Crossing the Threshold: Traditional Folk Art from the Russian Home is an exhibit of authentic folk art and contemporary replicas by renowned Russian artisans. 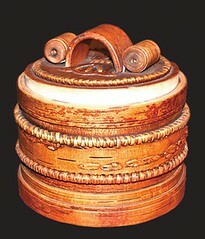 The artifacts decode the beliefs and culture of Russian peasants through crafts such as woodcarving, embroidery, basketry, metalwork, pottery, toy making and tailoring. Exhibit opens November 2, 2013 at the Museum of Russian Icons in Clinton, MA. Opening: Sunday, October 27, 3-5 p.m.
18th Annual Fine Furnishings Show, November 1st-3rd, Pawtucket Armory, Pawtucket, RI offering American made, handcrafted furniture, accessories & art from local, regional & national exhibitors in a wide range of styles, materials, price points. All items for sale, order, commission. Best in Show Awards, door prizes, demos, music, food & perhaps Rolling Owl Stool races...! 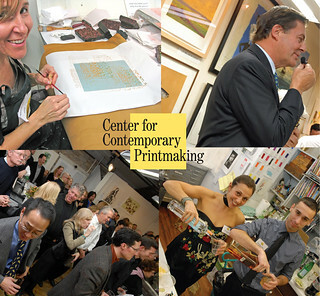 Over 75 Allston artists and creative professionals work in a wide variety of media. Artwork on show will include: painting, drawing, printmaking, photography, sculpture, egg tempera, collage, jewelry, leather, kites, mosaics and original clothing design. This year, shuttle bus service connecting the Allston Open Studio venues will be available, courtesy of the City of Boston. For Allston Open Studios artist & location details, plus shuttle bus information, please see the AAD website. The Blank-Wertz Gallery (at 119 Braintree) will have a survey exhibition featuring artwork from most participating studios artists, and is a great place for visitors to start. One app. One place. The whole universe. Now introducing the artscope app! Be the first to know - Coming straight from our live content, artscope brings you information on current exhibitions and art happenings. Our latest issue and online zine can be accessed right at your fingertips! 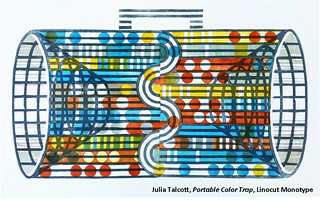 Click to download the FREE artscope app on the iPhone, DROID, iPad and Tablet today! 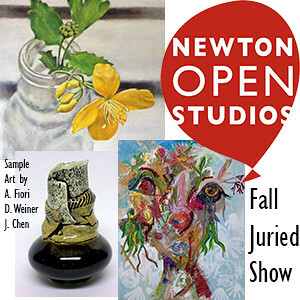 NOS Fall juried Show and Sale! 70 artist, all at Newton City Hall. Mika Hornyak, Sara Dassel, George Sopel. Free Raffle for hand-painted chairs by Mill Artists! Wine Deep Song by Gail Erwin, Van Dyke Brown. 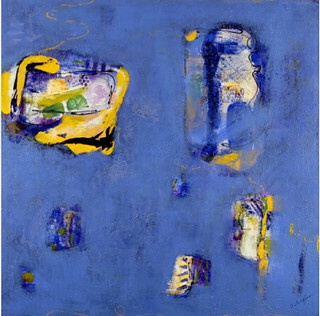 At first glance, Gail Erwin's printmaking, painting and hand papermaking are simply graceful. They are full of inviting forms and textures that instantly capture the eye. Revealed in a deeper look are the intricate perplexities of her works: light, tension, duality and exposure. Erwin combines 21st century digital technology and 19th century photographic techniques, creating new, unpredictable images with an added, haunting dimension. Cyanotype and Van Dyke Brown printing are nineteenth century non-silver alternative photo processes in which an emulsion is painted on a paper or fabric surface, exposed to light and then developed in water. 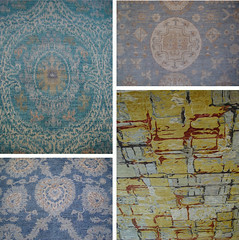 The results are blue-toned and brown-toned, respectfully, and the end product is allure. Erwin explores nature and landscape with the intention of examining the mystery that envelopes them, resulting in Arcadian images of an idealized landscape that captivate the viewer. Of her fascination with nature, Erwin says, "Energy and dissipation, growth and regeneration are the forces that shape the natural world, creating tension and duality. Time, age and memory are reflected in image and process." Arcadian Concert, Van Dyke Brown Prints will be on view Wednesday, October 30th through Sunday, December 1st at Kingston Gallery, where Erwin has been a member for 14 years. 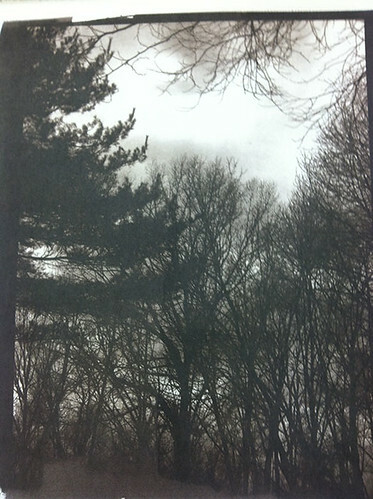 Gail also teaches at Massachusetts College of Art and Design in Boston and has taught at the DeCordova Museum School as well as other community arts centers. She continues to teach classes in her studio at ArtSpace Maynard. A First Friday Opening Reception for Arcadian Concert, Van Dyke Brown Prints will be held Friday, November 1st from 5-8pm. 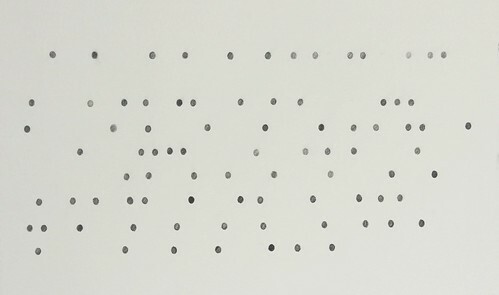 What you should know and be able to do (text voids) by Sarah Rushford, graphite on paper, 24" x 16". Have you ever felt like you're floating through whatever you're doing at the moment? Perhaps it's a craft, a skill, or a career. What's important to note is that the floating isn't a surrender or a sign of boredom; it's a movement from control to subconsciousness, from instruction to intuition. Interdisciplinary artist Sarah Rushford experiences this exact sensation as she works on projects, allowing her to transcend the boundaries of craft and theory and focus solely on the simplicity of the process. What you should know and be able to do is Rushford's solo exhibition of text art, works on paper, audio, video and sculpture that come from a space between the living argument of consciousness and the vivid interior self. Of her process, Rushford says, "I have a deep trust in intuition. I know there is a thinking that is above my conscious thinking that comes through doing. To get at these higher connections that are made, miraculously, I have to be very busy with the 'lower-level' work, much of which is cast off when the final work is realized." This creates final products of simplicity: materials like flour, sewing needles, ice and children's games and techniques like rubbing, folding, fixing and pressing. The almost over-simplistic nature of her projects leaves us with a strikingly vulnerable beauty. "My process is impatient, imprecise, inarticulate, playful, and I often feel foolish," Rushford says. "When a project comes to fruition, I have a mastery of a strange skill. I am working to articulate this mastery that exists on a continuum with foolishness." The level of honesty and universality radiating from Rushford and her works is appealing to anyone of any background, any discipline. As a multimedia artist, Sarah Rushford is currently working in writing, video and collage. In 2010, she started Circadia, a web and print design company for artists, small businesses and non-profits. She is also a member of Rise Industries, a forum for exchange between artists and a starting point for interdisciplinary collaborative projects. What you should know and be able to do opens tomorrow, Friday, October 25th at Hallway Gallery with an opening reception from 6-9pm. The exhibition will run through Saturday, November 30th and will feature an Artist Talk/Screening on Saturday, November 2nd from 7-9pm. A red carpet turned magic carpet transports guests to a bygone era. Art, film, music, dance, theater and a cast of over 50 artists host the party of the season inspired by the Golden Age of Hollywood. Armed with the best of the black and white era, 3Rivers Arts paints an evening lush with color, drama and intrigue. 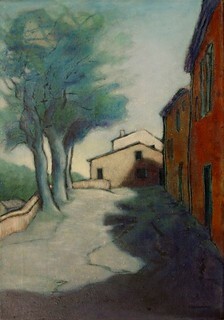 Road and Trees, Sabran by Andy Newman, oil on canvas, 28" x 20". Nan Hass Feldman, Thomas Halloran. Voted best on North Shore by Boston and Northshore magazines, AFA presents distinctive, engaging, and enduring works at exceptional value. 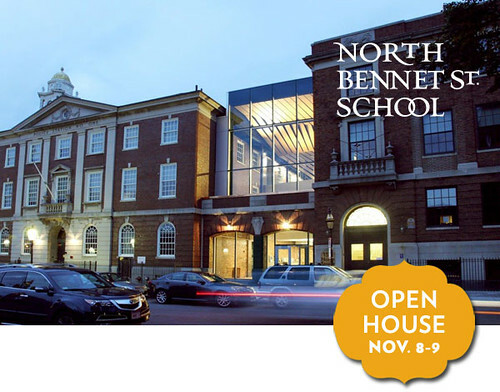 Learn the skills of fine craftsmanship through hands-on training in bookbinding, carpentry, cabinet and furniture making, jewelry making, locksmithing, piano technology, preservation carpentry and violin making at North Bennet Street School in Boston. Workshops, master classes and full-time programs. Open House & New Building Grand Opening -- November 8-9, 2013.